The Concern Leadership Network (CLN) is a community of motivated leaders, advocates, and influencers who are bringing about positive and lasting change to families living in extreme poverty around the world. Our members are creative, caring, and inspiring individuals who help Concern increase awareness and raise funds. Today, meet one of our newest members and Corporate Partnerships Co-chair, Erin Horetski. I am the Diabetes Prevention Program Coordinator at the American Association of Diabetes Educators. In September 2017, we were awarded our second grant from the CDC and are working to expand the National Diabetes Prevention Program to underserved communities throughout the US. What’s your cause? What is it that prompts you to make a difference? “Be the change you wish to see in the world.” I was probably in 6th grade when I saw this statement for the first time, and I have been trying to live out ever since. 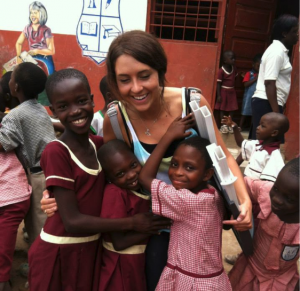 Erin in Accra, Ghana, for an overseas studies program with Central Michigan University, focused on malnourished children. I strongly believe that every person in this world, no matter where they come from, deserves basic needs in life. These basics include: access to education, nourishing food, clean water and a place to call home. It wasn’t until I traveled to Ghana, in Africa, that I truly understood these basic needs aren’t available to everyone. Unfortunately, poverty is everywhere and takes many forms. The reality is, no one chooses to grow up in poverty, it comes down to the luck of where you are born. What truly prompts me to make a difference in this world, is knowing that although my life isn’t perfect, I am in a better situation than many. I was lucky to be born into a family that had access to basic needs. If we are lucky enough to be living a good life, we should recognize this gift and show thanks and appreciation by looking out for others in need. When did you learn about Concern? How did you get involved? The way I came across Concern is quite interesting! I learned about Concern last October (2017), when I was searching for a Master’s of Global Health program online. When I was researching Northwestern’s program it directed me to a page that showed organizations you could get involved with or volunteer for. The list had about 60 different organizations. I was making my way down the list, and checking out different websites when Concern Worldwide came up. I clicked on the link to their website and within 30 seconds I knew I wanted to get involved. I could tell that this organization was worthy and helps communities in every capacity that is important to me. I emailed the volunteer email address right away! Why did you join the Concern Leadership Network? I joined the CLN for a couple different reasons. The first being to work with a group of like-minded individuals to really make a change in this world. I believe that when you have a group of individuals that are passionate and dedicated about the same cause, great things come out of it. This leads me to my second reason. I wanted to meet people who cared just as much about this cause as I do! I think that when you surround yourself with people who value the things that you value, you develop life-long relationships. What are your goals within, or for, the CLN? Are you working on any CLN projects right now? Yes, I am! I am currently working on the Corporate Partnership Committee with two other CLN members, Elizabeth and Francesca. We are in the process of putting together a toolkit for all CLN members, which will be full of resources to use when talking to CSR or HR departments within a company. We hope that these tools will help us reach our 2018 goal of $40,000 in corporate donations. I am also in the process of creating marathon training plans for the 10+ runners who are signed up for Concern’s NYC Marathon Team! Learn more about the Concern Leadership Network and how to join.